A paper on chicory plants — also known as “blue daisies” — won’t get its moment in the sun. 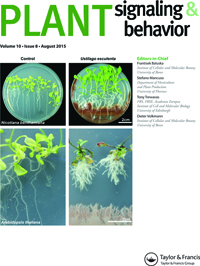 The “accepted author version” was published online in June, in Plant Signaling & Behavior. But before the so-called “version of record” could make it into an official issue of the journal — which is online-only — it was retracted. We, the Editor and Publisher of Plant Signaling & Behavior are removing the following article: Kimiya Ghanaatiyan, Hossein Sadeghi: “Divergences in hormonal and enzymatic antioxidant responses in Chicory ecotypes to salt stress,” Plant Signaling & Behavior. The authors were not able to pay the required page charges for this paper. Page charges apply at a rate of $100 per page or partial page used for articles classified as Reports, Research Papers, Technical Papers, Brief Reports and Short Communications. Corresponding author Hossein Sadeghi, who works at Shiraz University in Iran, told us that he withdrew the article after his institution would not pay for its publication, and that he has submitted it to another journal — one that is free. The results showed that germination characteristics and primary seedling growth were decreased in both ecotypes with increasing in salinity severity. The effects of salinity on radicle and plumule length as well as seedling weight were the same as its effects on seed germination. We’ve only found a few other instances where a paper was pulled over fee issues. Dental Materials Journal retracted three papers for that reason, and GM Crops & Food — like Plant Signaling and Behavior, published by Taylor & Francis — retracted one paper over a fee dispute. We emailed the journal editors, one of whom passed our note along to the publisher. We will update this post if we hear back. Why did they publish the accepted author version online before receiving payment. Surely they could have said that the author version would only be put online once they received the author fees. Also, the authors should have checked first with their institution whether they would pay the author fee if accepted. Why could Taylor & Francis simply not offer a waiver? It is well known that Iran is a country undergoing extreme financial difficulties. Moreover, it is not as if the journal has an IF that these authors can use to generate fees, as occurs in Iran, where papers are rewarded monetarily based on the IF score of the journal, and thus cover the costs of publication. So, the iron-fisted approach sounds somewhat unfair, although admittedly, the authors should have known the risks when they submitted the paper. After all, if the science was peer reviewed and deemed fit enough for publication, the message that this withdrawal sends is that only money talks. As for GM Crops & Food, this journal used to be published by Landes Bioscience. I would be curious to know what the EICs (Frantisek Baluska, Stefano Mancuso, Tony Trewavas, Dieter Volkmann) think. I feel that the issue is rather about the genuine willingness of the government-decision-makers to develop academic research, with a fair balance between military budgets (aka National Defence Budget) and the civilian research programmes. Considering the number of papers being pulled for faking jury confirmation, and then learning that authors have to pay these journal publishers, who charge huge outrageous fees for their subscriptions… there is somethign seriously wrong with academic journal publishing when authors need to buy a slot for publication. Pay the fee or we won’t publish your paper? Gentlemen and ladies, veracity has left the building! Isn’t a disclaimer detailing all fees paid and by who and why to obtain the publication of an article needed to assure complete transparency. Anything else places a cloud on the article. Just one person’s experience and opinión here, but in comparing the information different journal publishers provide about their access options and various processing and publication fees authors are expected to pay, I found Taylor & Francis journal sites to be especially confusing even for me – with English as my first language and about 30 years’ experience in research publishing. The authors of this article may well have misunderstood what the journal expected from them. Let’s not assume any bad faith on the authors’ part for now. We don’t know all the details. I would be peeved if I had been a reviewer. Well, think of the bright side. The authors can now send their freely reviewed paper to another journal with a higher “ranking”. Move on. Lesson learnt. Isn’t it time for ” we don’t work for publishers” movement? And what’s wrong with our universities’ repositories? Why do (plant) scientists still pay extraordinary OA publishing fees? Are they aware that their paper could probably get more views and citations if they posted their work freely on a site like ResearchGate? Scientists need to rething the intrinsic vs real value of OA fees, and understand that, in most cases, one is simply paying for the publishing “brand”.